Some of you are aware that we had a rather unusual tradition at our place in Abbotsford, BC. Every January 31 we would walk through the yard and count all of the different varieties of flowers, shrubs and trees that were in bloom. It started by accident just over 20 years ago when I happened to notice seven different types of plants in bloom on January 31. Since then, we have counted between 10 and 22 different varieties blooming on January 31. People became aware of this tradition and would ask us “how many were in bloom on January 31?” People living in colder parts of the country, especially, were fascinated to know that we had plants in bloom while they were experiencing the middle of winter. The average number of plants in bloom in our yard grew over the years because we began seeking out and planting shrubs and flowers that would tend to bloom in the winter. We have known all year that we won’t be doing an outdoor flower count this January 31 and were aware that it was one of the things that we would miss most about living in BC. We were delighted, but slightly nostalgic, to receive some photos today from the new owners of some of the bulbs in bloom in our former yard. Our winter here has been generally quite mild this year but is still too cold for things to be growing. Even though we can’t have blooming plants outside here in the winter, we do have sunny south-east facing windows and have just started to acquire some plants to take advantage of them. 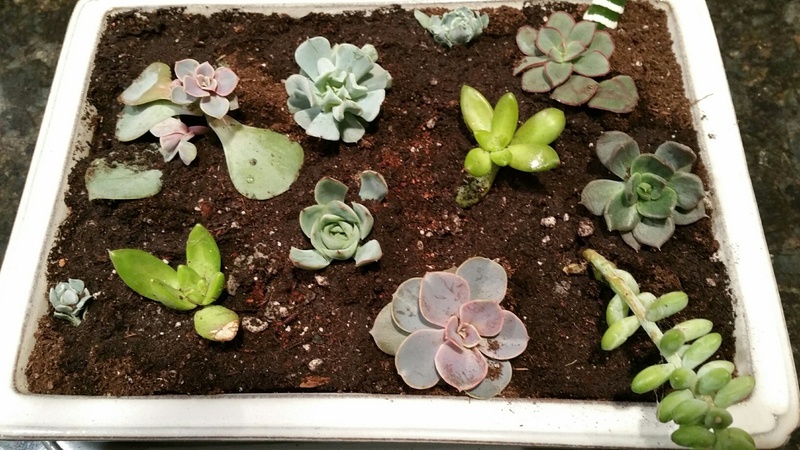 Soon we will be putting trays of seeds in the windows to get a head start on spring planting outdoors but, in the meantime, here are a few things taking the place of our outdoor blooms. 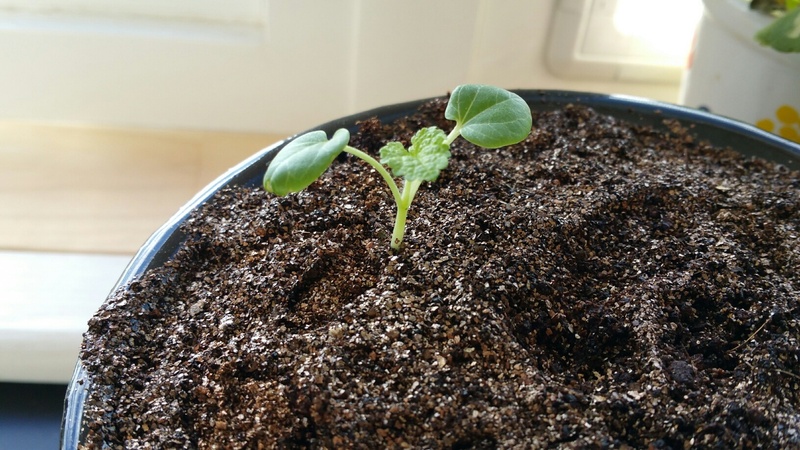 The first plant from seed that we have grown in Ontario. A wild west coast rose sent from BC by our good friend, Trudi. The indoor sedum love the sunny window sills. Sheila has divided the old we brought from BC and started these new ones. 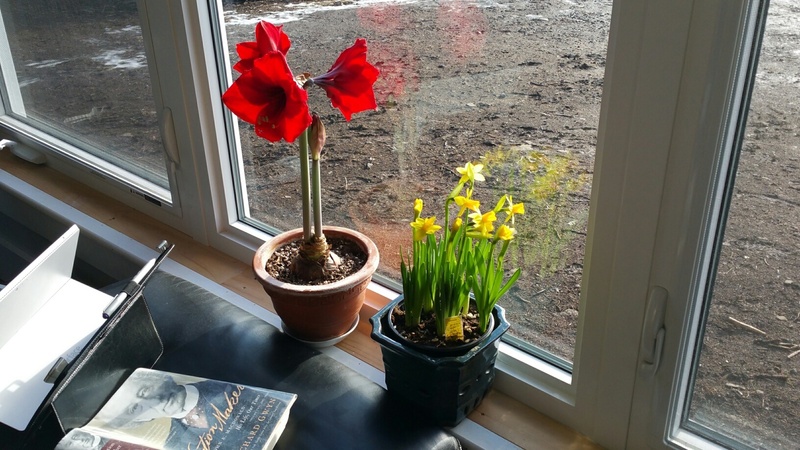 The ground outside is still partly frozen but this amaryllis and these daffodils are making it feel more like spring in the house. 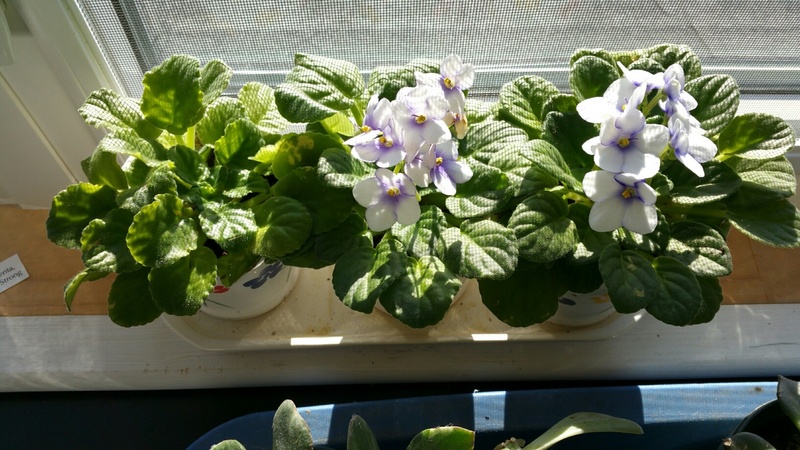 Neighbours gave these African violets from their window sill to us when they left for Florida for the winter. It is good to see that you still have the amaryllis blooming (I miss you lending them to me). My snowdrops are blooming – the ones I took along from our previous house, also the hellebores is in full bloom. I also saw some witch hazel blooming and remember that you used to bring those over. Be well and I hope spring comes soon for you.